If you’ve ever wondered what pure joy looks like on screen, look no furtherthan the latest film in the DC Universe, Aquaman. It’s littered with moments that marry grand spectacle, rousing music, and dramatic stakes with results sure to elicit ear-to-ear smiles from anyone from ages 8 to 80. Director James Wan (Insidious, The Conjuring, Furious 7) has infused his DC adaptation with a flair we rarely see in filmmaking these days. It’s as if, with every single take, he said: “Well, if we’re going to make a movie about a muscle-bound man who talks to fish, let’s make this really crazy.” Then you get scenes of two characters kissing while the camera does multiple 360-degree circles around them, complete with massive explosions and frickin’ laser beams whizzing by their heads. It’s bonkers. It’s bananas. It doesn’t always work but when it does, oh wow, is it fun. Aquaman takes place sometime after the events in DC’s Justice League but that connection is only mentioned in passing. This may be set in that universe but it’s very much a standalone Arthur Curry (Jason Momoa) story. We basically see his entire life, from pre-birth though adulthood, with a strong focus on his parents Thomas Curry (Temura Morrison) and Queen Atlanna (Nicole Kidman). Their dynamic is one of several emotional pins the film hangs on and by far the strongest. Thomas is from the land, Atlanna from the ocean, and since his mother is forced to go back to the ocean, Arthur grows up on land and feels much more protective of it, if he really feels protective of anything at all. That duality is weaved throughout the whole movie. Does Arthur care about the land, the ocean, or neither? There are other emotional strands too, such as with his mentor Volkoff (Willem Dafoe) and a budding relationship with Mera (Amber Heard) but those are mostly an afterthought to the main plot, which is an effort to stop an all-out war between the seven kingdoms of the seas and the surface world. Long-time James Wan collaborator Patrick Wilson is King Orm in Aquaman. 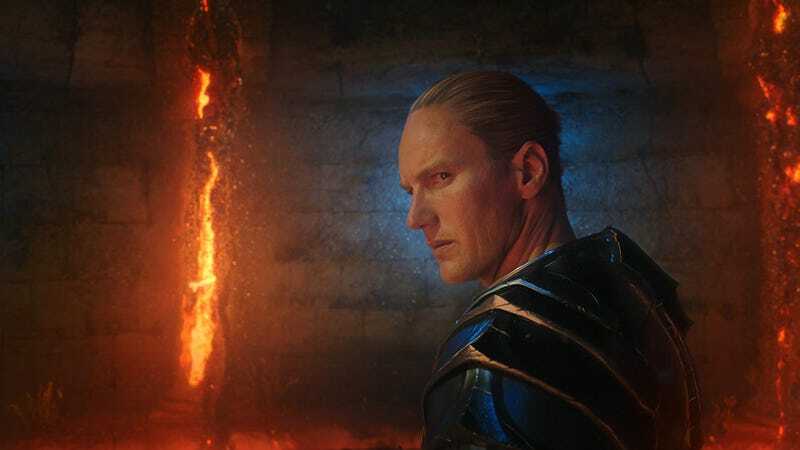 That war is being driven by King Orm (Patrick Wilson), Arthur’s half-brother and current king. His fiancé, Mera, goes behind his back to try to recruit Arthur to stop the coming war, but he wants nothing of it. He’s still the reluctant hero we saw in Justice League. This leads to a hell of a lot of exposition explaining the seven kingdoms, world history, mythology and much, much more. It can be a lot and, at times, does squeak the focus away from the center. Eventually, though, Arthur and Mera team up for a globe-trotting quest to retrieve the ancient trident that can unite the seven and prove Arthur, Queen Atlanna’s firstborn, is the one true king, even if he is of half-blood. You know the Sharks vs. the Jets, but what about the Sharks vs. the Sea Lions? However, while the underwater stuff is undeniably stunning, it’s at times plagued a lack of visual continuity. 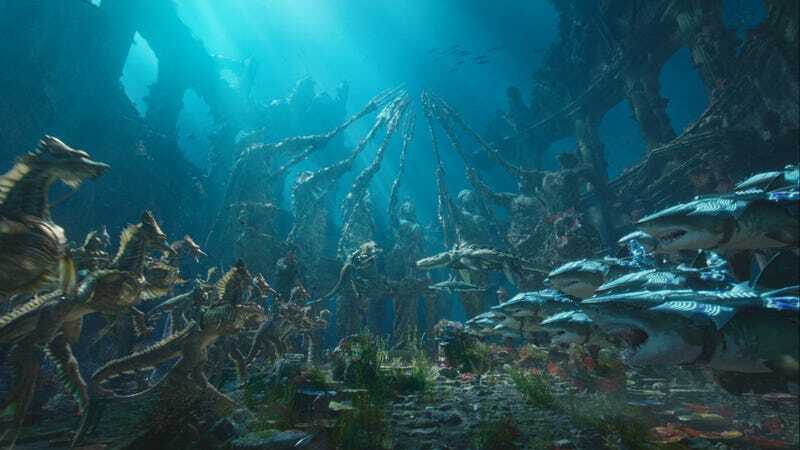 These are human-like beings living underwater and yet in one scene their movements look and feel one way, while in another scene they feel totally different, You get a sense that visual effects artists with totally different rules were working on different shots within the same scenes. However, just when things get a little wonky, Wan dials the film back up with an epic gladiatorial battle or an underwater transport chase reminiscent of something from Top Gun and you’ll quickly forget any weird visual quirks. You’ll once again be taken on the adventure. The film’s tone mirrors that feeling, with a melodramatic dash of cheesiness evenly spread throughout the entire film. Aquaman knows it’s a movie about a man trying to become king of an underwater world, so it buys into its ridiculousness with plenty of levity to go along with the gaudy visuals. At times that can go a little too far, with one or two too many pop culture references stuffed into the conversation or humour that’s childish at best. And yet, somehow, it fits, because everything else happening is so completely oblivious to reality. People probably would talk like that in a world where sea creatures attack a ship and the film shifts into slow motion taken from the movie 300, complete with signature guitar riffs rocking the soundtrack. Kekoa Kekumano plays young Arthur in some awesome flashbacks in Aquaman. Wan’s film IQ throughout Aquaman is also worth noting. 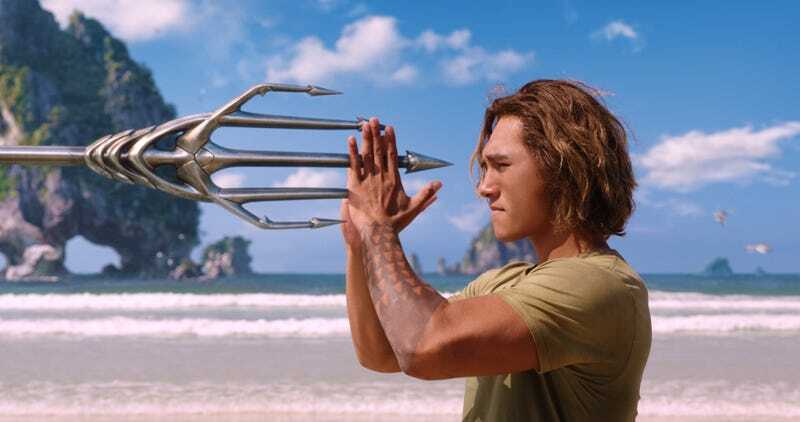 Though it feels very standalone, especially from other superhero movies, Aquaman is deeply rooted in teen and adventure movies of the past. There are a few less than subtle Karate Kid callbacks, as well as references to Thundercats, Flash Gordon, Clash of the Titans, Excalibur, Godzilla, Pinocchio, Jurassic Park, Top Gun, 300, and more. These give Aquaman a nice sprinkling of familiar to go along with the crazy visuals, helping to make the film just a bit nostalgic while also being fresh and exciting. It’s weird though. Despite all the things Aquaman has going for it, there’s no denying the acting in the film is merely adequate. That the dialogue isn’t exactly smart. Some of the characters don’t change all that much. And yes, the film could have been better if those things were all up to the level we know the people involved are capable of achieving. And yet, Aquaman is made with such spirit, with such lofty goals when it comes to world-building, somehow those things get pushed aside, the 12-year-old inside you comes out, and you eat it all up like a kid in a candy store. This is grandiose, big-budget entertainment at its most self-aware, and even when it swings and misses, it’s still a sight to behold.